It has been brought to my attention that people have been using the words "bribe" or "fraud" when submitting their expense claims. Whilst, in most cases, this has arisen because people are covering fraud or bribery cases, please can everybody refrain from using these words in future. 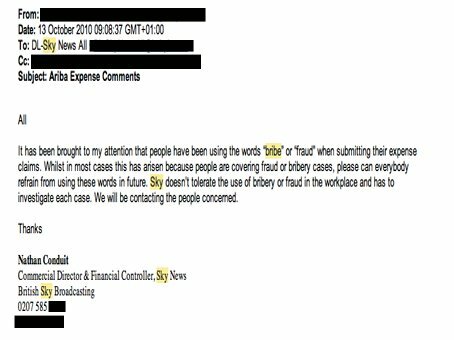 Sky doesn't tolerate the use of bribery or fraud in the workplace and has to investigate each case. We will be contacting the people concerned. Now it's hard to say if this is genuine or not, but if it is it's certaintly an interesting use of the term "whilst in most cases". Makes you wonder what the other cases involved. Update - I'm currently working on finding an original source for this email, along with any headers to prove it's genuine.